The outgoing First Lady of the United States, Michelle Obama, on Friday used her last official White House speech to deliver an emotional remark to the nation’s young people, especially immigrants, Muslims and others who might feel slighted by the incoming Donald Trump administration. OBAMA: Hey! (Applause.) What’s going on? (Applause.) Thank you all so much. You guys, that’s a command — rest yourselves. (Laughter.) We’re almost at the end. (Laughter.) Hello, everyone. And, may I say for the last time officially, welcome to the White House. Yes! (Applause.) Well, we are beyond thrilled to have you all here to celebrate the 2017 National School Counselor of the Year, as well as all of our State Counselors of the Year. These are the fine women, and a few good men — (laughter) — one good man — who are on this stage, and they represent schools from across this country. And I want to start by thanking Terri for that wonderful introduction and her right-on-the-spot remarks. I’m going to say a lot more about Terri in a few minutes, but first I want to take a moment to acknowledge a few people who are here. First, our outstanding Secretary of Education, John King. (Applause.) As well as our former Education Secretary, Arne Duncan. (Applause.) I want to take this time to thank you both publicly for your dedication and leadership and friendship. We couldn’t do this without the support of the Department of Education under both of your leadership. So I’m grateful to you personally, and very proud of all that you’ve done for this country. MRS. OBAMA: Keep it down. (Laughter.) Keep it together, ladies. Wale is here. And of course, Allison Williams and her mom are here. And all these folks are here because they’re using their star power to inspire our young people. And I’m so grateful to all of you for stepping up in so many ways on so many occasions. I feel like I’ve pestered you over these years, asking time and time again, “Well, where are you going to be?” “I’m going to be in New York.” “Can you come? Can you come here? Can you do this? Can you take that? Can you ask for that? Can you come? Can we rap? Can we sing?” (Laughter.) So thank you all so much. It really means the world to this initiative to have such powerful, respected and admired individuals speaking on behalf of this issue. So congratulations on the work that you’ve done, and we’re going to keep working. And finally, I want to recognize all of you who are here in this audience. We have our educators, our leaders, our young people who have been with us since we launched Reach Higher back in 2014. Now, when we first came up with this idea, we had one clear goal in mind: We wanted to make higher education cool. We wanted to change the conversation around what it means and what it takes to be a success in this country. Because let’s be honest, if we’re always shining the spotlight on professional athletes or recording artists or Hollywood celebrities, if those are the only achievements we celebrate, then why would we ever think kids would see college as a priority? So we decided to flip the script and shine a big, bright spotlight on all things educational. For example, we made College Signing Day a national event. We wanted to mimic all the drama and excitement traditionally reserved for those few amazing football and basketball players choosing their college and university teams. We wanted to focus that same level of energy and attention on kids going to college because of their academic achievements. Because as a nation, that’s where the spotlight should also be — on kids who work hard in school and do the right thing when no one is watching, many beating daunting odds. We are also very proud of all that this administration has done to make higher education more affordable. We doubled investments in Pell grants and college tax credits. We expanded income-based loan repayment options for tens of millions of students. We made it easier to apply for financial aid. We created a College Scorecard to help students make good decisions about higher education. And we provided new funding and support for school counselors. (Applause.) Altogether, we made in this administration the largest investment in higher education since the G.I. Bill. (Applause.) And today, the high school graduation rate is at a record high, and more young people than ever before are going to college. And we know that school counselors like all of the folks standing with me on this stage have played a critical role in helping us get there. In fact, a recent study showed that students who met with a school counselor to talk about financial aid or college were three times more likely to attend college, and they were nearly seven times more likely to apply for financial aid. So our school counselors are truly among the heroes of the Reach Higher story. And that’s why we created this event two years ago, because we thought that they should finally get some recognition. (Applause.) We wanted everyone to know about the difference that these phenomenal men and women have been making in the lives of our young people every day. And our 2017 School Counselor of the Year, Terri Tchorzynski, is a perfect example. So when students at Terri’s school reported feeling unprepared to apply for higher education, Terri sprang into action to create a school-wide, top-to-bottom college-readiness effort. Under Terri’s leadership, more students than ever before attended workshops on resume writing, FAFSA completion — yes, I can now say FAFSA — (laughter) — and interview preparation. I can barely say it. (Laughter.) They did career and personal — personality assessments. They helped plan a special college week. And they organized a Military Day, hosting recruiters from all branches of our armed forces. And because of these efforts, today, 75 percent of Calhoun’s seniors now complete key college application steps, and Terri’s school has won state and national recognition. And this is what each of you do every single day. You see the promise in each of your students. You believe in them even when they can’t believe in themselves, and you work tirelessly to help them be who they were truly meant to be. And you do it all in the face of some overwhelming challenges — tight budgets, impossible student- counselor ratios — yeah, amen — (laughter) — endless demands on your time. You all come in early, you stay late. You reach into your own pockets — and see, we’ve got the amen corner. (Laughter.) You stick with students in their darkest moments, when they’re most anxious and afraid. And if anyone is dealing with a college [high school] senior or junior, you know what this feels like. These men and women show them that those kids matter; that they have something to offer; that no matter where they’re from or how much money their parents have, no matter what they look like or who they love or how they worship or what language they speak at home, they have a place in this country. And as I end my time in the White House, I can think of no better message to send our young people in my last official remarks as First Lady. So for all the young people in this room and those who are watching, know that this country belongs to you — to all of you, from every background and walk of life. If you or your parents are immigrants, know that you are part of a proud American tradition — the infusion of new cultures, talents and ideas, generation after generation, that has made us the greatest country on earth. If you are a person of faith, know that religious diversity is a great American tradition, too. In fact, that’s why people first came to this country — to worship freely. And whether you are Muslim, Christian, Jewish, Hindu, Sikh — these religions are teaching our young people about justice, and compassion, and honesty. So I want our young people to continue to learn and practice those values with pride. You see, our glorious diversity — our diversities of faiths and colors and creeds — that is not a threat to who we are, it makes us who we are. (Applause.) So the young people here and the young people out there: Do not ever let anyone make you feel like you don’t matter, or like you don’t have a place in our American story — because you do. And you have a right to be exactly who you are. But I also want to be very clear: This right isn’t just handed to you. No, this right has to be earned every single day. You cannot take your freedoms for granted. Just like generations who have come before you, you have to do your part to preserve and protect those freedoms. And that starts right now, when you’re young. Right now, you need to be preparing yourself to add your voice to our national conversation. You need to prepare yourself to be informed and engaged as a citizen, to serve and to lead, to stand up for our proud American values and to honor them in your daily lives. And that means getting the best education possible so you can think critically, so you can express yourself clearly, so you can get a good job and support yourself and your family, so you can be a positive force in your communities. And when you encounter obstacles — because I guarantee you, you will, and many of you already have — when you are struggling and you start thinking about giving up, I want you to remember something that my husband and I have talked about since we first started this journey nearly a decade ago, something that has carried us through every moment in this White House and every moment of our lives, and that is the power of hope — the belief that something better is always possible if you’re willing to work for it and fight for it. It is our fundamental belief in the power of hope that has allowed us to rise above the voices of doubt and division, of anger and fear that we have faced in our own lives and in the life of this country. Our hope that if we work hard enough and believe in ourselves, then we can be whatever we dream, regardless of the limitations that others may place on us. The hope that when people see us for who we truly are, maybe, just maybe they, too, will be inspired to rise to their best possible selves. That is the hope of students like Kyra who fight to discover their gifts and share them with the world. It’s the hope of school counselors like Terri and all these folks up here who guide those students every step of the way, refusing to give up on even a single young person. Shoot, it’s the hope of my — folks like my dad who got up every day to do his job at the city water plant; the hope that one day, his kids would go to college and have opportunities he never dreamed of. That’s the kind of hope that every single one of us — politicians, parents, preachers — all of us need to be providing for our young people. Because that is what moves this country forward every single day — our hope for the future and the hard work that hope inspires. 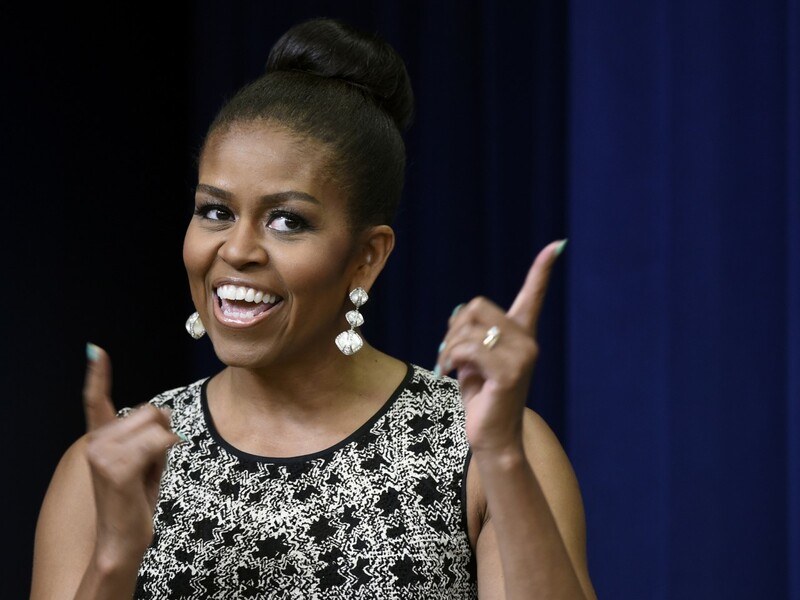 So that’s my final message to young people as First Lady. It is simple. (Applause.) I want our young people to know that they matter, that they belong. So don’t be afraid — you hear me, young people? Don’t be afraid. Be focused. Be determined. Be hopeful. Be empowered. Empower yourselves with a good education, then get out there and use that education to build a country worthy of your boundless promise. Lead by example with hope, never fear. And know that I will be with you, rooting for you and working to support you for the rest of my life. And that is true I know for every person who are here — is here today, and for educators and advocates all across this nation who get up every day and work their hearts out to lift up our young people. And I am so grateful to all of you for your passion and your dedication and all the hard work on behalf of our next generation. And I can think of no better way to end my time as First Lady than celebrating with all of you. So I want to close today by simply saying thank you. Thank you for everything you do for our kids and for our country. Being your First Lady has been the greatest honor of my life, and I hope I’ve made you proud.